Part 1c concludes with the breath - half-moon and whole-body breathing, the chi breathing point, the Psoas muscles and the hanging basket - suspending the pelvis, closing technique for ending each practice session, how to apply what you've learned and what to expect as you explore the Wuji standing meditation practice. 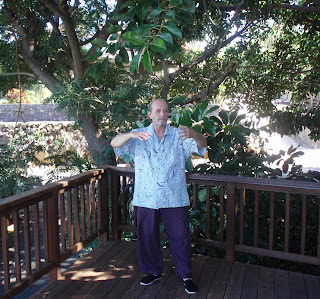 Part 1b summarizes, reviews and continues with the basic components of the Wuji posture, position of the legs, unlocking the knees, using gravity to release blockages, explanation of SUNG, the body's ideal state. Surrendering to gravity - dropping the weight below the feet, the two types of muscles - mobilizers and stabilizers. 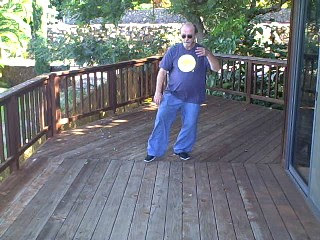 Part 1 includes the basic mechanics of the stand using the Wuji posture. Alignment of the feet, the three parts of the feet and their importance, the central, left and right deep channels of Chi Gung, the feet as the benchmark of your stand and gravity, arm and hand positions, the spine, eliminating it's three curves, activating Feng Fu point at the base of the skull, how all nerve messages pass through this point from the brain to the body, the position of the head and neck, releasing the chest and rounding the back. 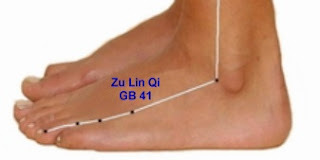 In this post I will discuss the relationship of the acupuncture point Zu Lin Qi (GB-41) to the connection, adjustment and balancing of the hip. Point location: In the depression distal to the junction of the 4th and 5th metatarsal bones, on the lateral side of the tendon of m. extensor digiti minimi of the foot. For the purposes of Zhan Zhuang this point comes out just behind the "little ball" of the foot. 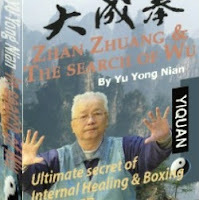 Although Zu Lin Qi has a number of important internal functions, for the purpose of this discussion we will focus on it's auxillary ability to directly release the hip. 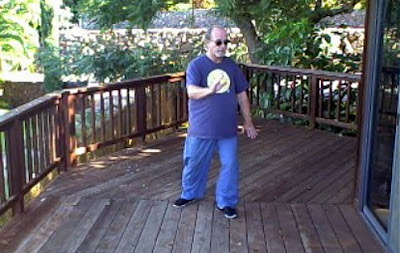 Connecting GB-41 to open and adjust the Hip: Without shifting central equilibrium, focus on the point (on the top of the foot) relaxing until you can feel where the additional weight comes out on the bottom of the foot (behind the "little ball.) Notice the change in how the hip feels. 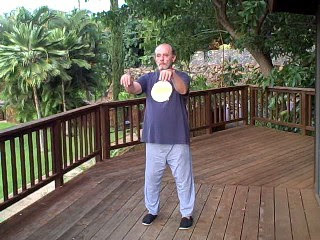 Repeat the above process several times until you feel a substantial release (or adjustment) in the hip and/or a greater connection between the two locations. It is often difficult to know what to do when some part of your body feels odd or becomes sore while practicing Zhan Zhuang. In fact the techniques to remedy this are seldom taught. In this post I will discuss the use of the elbows, specifically adjusting the distance of the elbow from the spine to alleviate discomfort and restore Sung. 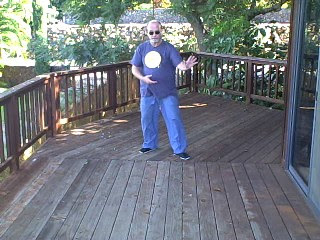 In this example we'll use the universal posture (holding the ball or embracing the tree.) Please note: the further the elbow tips are away from the spine (front to back as well as horizontally) the more the deep structural muscles are stretched. If there is too much strain the body will be unable to relax properly and one can end up tighter than when they started. 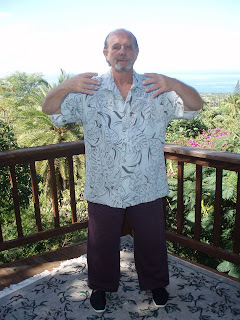 To prevent this: without changing the width of the posture move the elbows back a little toward the spine (or mid-line of the body if you bisect it horizontally) Inhale up to the clavicle then as you exhale, relax the upper back and allow the elbows to drop very slightly downward and forward. When done properly you will feel an expansion in the upper back as more and more muscle tissue engages to help support the arms. The whole shoulder girdle will become more relaxed and your arms will feel lighter. In addition to the lateral shake used to generate Fa Jing there is another method involving the 'tucking' of the tail bone. 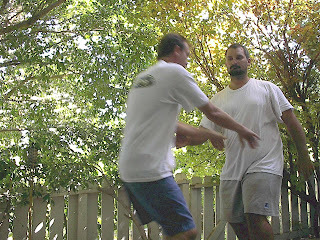 The technique is fairly simple to describe but initially difficult to execute. This drives the weight from the heel or mid-line point to bubbling well. The effect of this is to greatly enhance the frequency of Qi being emitted which, in push hands, will dig out (uproot) the opponent, always feet first.